Increase in recycling stocks increase in insurance may occur. As recyclable material stops moving to China, there will be increased pressure to hold stocks at recovery and transfer facilities. The track record of fires in the industry has increased Environment Agency vigilance on stocks occurring outside licensed conditions. This has also increased the need for more sophisticated techniques such as thermal monitoring equipment for bales and waste piles. This all restricts the abilities of companies to stockpile material. If you are allowing your hazardous contaminated packaging for reuse or recycling down these routes there are a couple of potential consequences. There could be an abrupt interruption to your collection process. Materials could be stored for extended periods. 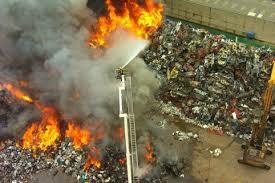 If there is a fire enforcement and paperwork trail analysis is inevitable. More fires results in increased insurance premiums. Insurance costs for waste management and recycling companies are increasing rapidly. In an industry already convulsed by liability insurances 10-15 times that you would expect for equivalent industries without the fire record, this is difficult news. 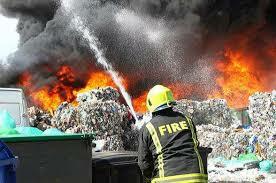 Barely a week goes by without reference to a waste or recycling fire. Hazardous waste site fires have also been significant, the total destruction of a state of the art facility in Skelmersdale in December last year being a major example. With a sophisticated tracking system, EA and HSE approval all in place, human error is still potentially at the heart of serious incidents. Remembering the scrap yard set alight by a Chinese lantern in the Birmingham area, or instances of fires caused by the unexpected combustion, spontaneous or otherwise of incorrectly described material and you can easily see why insurance costs rise rapidly. Transport related liability cover is also attracting hefty premium increases. As insurers acknowledge that low interests are here to stay, and that increases will be small and slow, the cost of payouts for ‘all of life’ incidents is increasing to compensate. All transport companies can expect above inflation increases for some years to come due to this process of adjustment. This will be passed on in increased transport charges to customers. Are your current suppliers capable of withstanding these increases? Check the policy and reconfirm the £10,000,000 indemnity. If only at £5.000,000 reconsider their suitability. Choosing your waste or recycling supplier is more complex than ever and being aware of these overhead pressures important. It is essential in all supply chain arrangements that risks are managed. This includes the risk of supply fracture due to inadequate insurance. Some waste brokers and ill-advised companies may not take this fully into consideration. Posted in Waste Disposal and tagged hazardous waste fires, insurance, recycling, waste disposal, waste hierarchy.